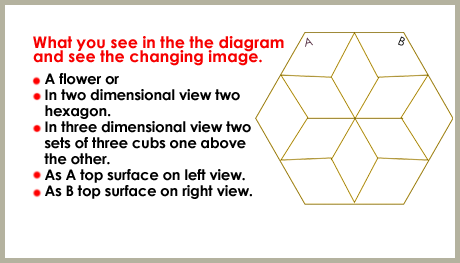 A paradigm refers to a model, a perception, a pattern, or set of mental thoughts that illustrates certain aspects about the world and its reality. Our mind usually constructs these models or ideas about the world, which we use to make our day to day decisions. A paradigm is like a map. A map shows where the different places are located and how they are related to each other by distance, horizon, objective etc. When we first enter a city, the map of that city helps us to move around. As we get familiar with the city, it develops into a mental map, more detailed and realistic than the one on a paper. The more we move around in the city, the more our paradigm shifts towards the comprehension and reality of that city. When paradigms are not true reflections of reality, they can limit our progress. Imagine exploring the city of London with a map titled New York! Similarly, the wrong paradigm could result in enormous inconvenience and failure. It may happen that when we reach the zenith, we might find a different place than we planned earlier. Therefore, it is important to understand truth and reality before we take our first step. Majority of the problems with the Muslims is that they are away from the true Islamic paradigm. They are lost with the circumstances, hijacked by worldly benefits and also their failure to discover human role and responsibilities. If we are in the Truth Paradigm, we are safe and successful. To attain the truth paradigm, we need to adhere to four basic themes: Truth, Submission, Humility and Accountability. A deep crisis in life - an accident, a tragedy, a loss - usually makes one to think about the causes and effects of the crisis, leading to a paradigm shift which becomes a turning point in one? life. Deep motivation to attain a cherished goal - Motivation leads one to strive for lofty aims and helps the individual to retain the focus that is so important for success. The fear of ill health, disease, death gives us an opportunity to think and reflect. Imagine if one were to know that he would live only for a few more months what is expected from him. Obviously he would try to do only good deeds in the balance of his lifetime. The fear of death can be the cause for a paradigm shift. An open mind and willingness to exert oneself is the ground for a paradigm shift. Personal effort determines the extent to which the paradigm shift can take place. The Truth is the Starting point of all explorations. It is the destiny of the target. It is a vehicle to explore or an instrument to probe. Scriptures say about Truth. so does science. Hidayath or True Guidance, given by God, constitutes the paradigm shift in Islam. Hidayath is the True Guidance that make the human beings accept the Truth without doubt in humility and accountability. If one puts the efforts to learn one may get Hidayath. By studying Holy Quran and Prophetic Traditions, Islamic literature, books, magazine, audio/video cassettes, CD-ROMs etc. The Truth paradigm (Hidayath) can change our mind set and perceptions towards the Islamic reality leading to the Straight Path - the only Path. This Principle is the opening point of successful philosophy of Islamic living. This shift protects from all failures and defeats. Hidayath or True Guidance, which is given by God, constitutes the paradigm shift in Islam. Hidayath is the True Guidance that make the human beings accept the Truth without doubt in humility and accountability. By studying the life and experiences of the Prophet and His Companions. The first step towards achieving success both in this world land the hereafter is to practice the True Guidance of Almighty. This demands a flexible approach towards attuning the mind to change for a shift in paradigm. 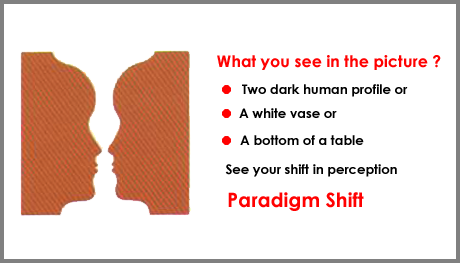 Prepare yourself for a paradigm shift, is the starting point towards success. This shift in paradigm continues throughout in the succeeding principles and every principle is shifting towards Islamic reality like a class beginning with a problem and ending with a solution.